In 2015, 54 countries had developed National Action Plans (NAPs) on UN Security Council Resolution (UNSCR) 1325  to integrate gender perspectives into all areas of their peace and security policy-making and practices. Today, that number has grown to 64. 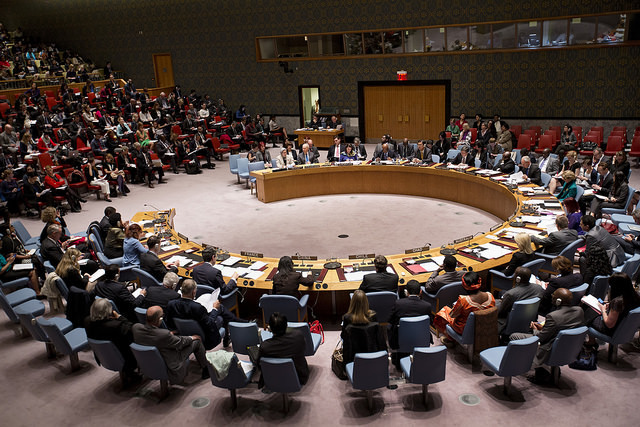 There appears to be growing commitment among UN member states, such as Australia, to implement their international commitments to advance the Women, Peace and Security agenda. But to have any impact on the lives of women and girls in conflict and to influence the process and outcome of peace processes, these NAPs can’t just be statements of commitment. They need robust monitoring and evaluation frameworks  to ensure accountability, with indicators, targets, benchmarks and reporting mechanisms to measure the effectiveness and outcomes of strategies and actions. It’s in ensuring accountability to NAP commitments that civil society has the most pivotal role to play, according to the UN . The 2015 Global Study on the Implementation of UNSCR 1325  highlights Australia’s shadow reporting process, undertaken by civil society organisations, as an example of best practice in facilitating that accountability. The Fourth Annual Civil Society Report Card, launched this week in Canberra, offers an independent and public assessment of the Australian government’s commitment, on paper and in practice. Many of the Report Card’s key findings echo those of the Independent Interim Review of the Australian National Action Plan on Women, Peace and Security . Noting the absence of a rigorous monitoring and evaluation framework, both the Review and the Report Card point to challenges in holding the government accountable against its commitments. The Report Card finds that more needs to be done by the government to realise the transformative vision of the Women Peace and Security agenda, specifically in its core areas: facilitating women’s participation in all areas of peace and security activity, and accounting for differential impacts of security policies on men and women. For example, this week’s announcement of increased funding to the AFP  for crime fighting and counterterrorism should be balanced by an equal investment in both international and national women’s organisations working towards stabilisation, preventing crime, terrorism and violent extremism. The Report Card advises that countering violent extremism and terrorism requires an ‘approach that is gender-aware, evidenced-based, preventative in design, and that includes women as decision-makers in all policy responses’. Similarly, the decision to support US-led airstrikes in Syria in response to the Assad regime’s use of chemical weapons needs to consider a gender perspective. That would require more than simply stating, as Prime Minister Turnbull did , that the strikes were a ‘swift and just response to a regime that ‘gass[es] its own people, women, and children, babies.’ It requires leadership and expertise to advise on the impact of the strikes upon women and girls; their continued protection needs in the aftermath of any military action; and the impact of those actions on the resolution of conflict. Australia’s foreign policy, development and humanitarian responses to the Syria crisis must advocate and commit support for women’s rights organisations; for women’s leadership in humanitarian action; and women’s participation in the peace process . Such action—which draws on a rapidly growing evidence base that identifies the positive links between the presence of women’s human rights and political stability —would establish Australia as an outstanding leader on women, peace and security. While there are chances to improve practice, Australia has already made some strides.. The Report Card notes the progress made by the Australian Defence Force and the Australian Federal Police in operationalising the Women, Peace and Security agenda. That includes: the significant steps taken to address sexual and gender based violence; DFAT’s work supporting women’s participation in peace processes ; and the whole-of–government assistance provided by the Australian Civil-Military Centre, including its support for civil society through funding the Annual Civil Society Dialogue and Report Card. And the government’s establishment of the Office of the Ambassador for Women and Girls ; its commitment to increasing the number of women in senior and pivotal peace and security decision-making roles; its efforts to recruit and retain women in the ADF and AFP; and its commitment to mainstream gender in all foreign policy and development practice remain positive signs. And what’s more, the message is penetrating across government. The government’s Women, Peace and Security efforts and civil society’s responses have, as the Report Card notes, started a conversation. That conversation is replete with promising rhetoric and commitments, but has some distance to travel. The goal is to make Women, Peace and Security mundane; an everyday and unremarkable part of peace and security policy-making and practice. It’s time to move beyond measuring successes in ‘firsts’ or in the language of ‘laying foundations’. Continuing the conversation between government and civil society and working in partnership to develop a strong second National Action plan is the next step. Katrina Lee-Koo is the Deputy Director of Monash GPS (Gender, Peace and Security) and Anu Mundkur is ACFID’s representative on the Australian Civil Society Coalition on Women Peace and Security. Image courtesy of Flickr user UN Women.